Ajax Tocco Magnethermic's induction technology is providing the answer to many modern strip processing quality and production problems. 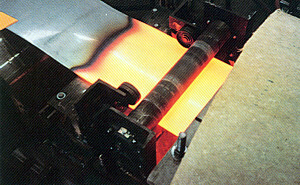 Our expertise with galvanizing, galvannealling, pre-heating, aluminizing, heat treating, or curing has been at the forefront of applying clean, precise induction heating technology for the steel industry (click an area on the graphic or one of the buttons below to learn more and visit that page). Ajax TOCCO offers solid state induction technology along with innovative inductor designs enabling mills to dramatically improve processes such as bar and slab rolling, and strip processing. 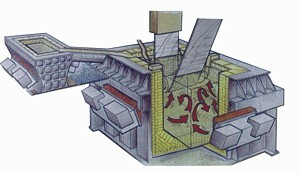 In-Line induction heaters working in conjunction with continuous casting lines save thousand of energy dollars by utilizing casting generated heat and restoring only the additional energy required to reach optimum rolling temperature. Continuous strip heating with strategically placed heating coils that accurately control temperature cycles using only a fraction of the space of convention heating methods. 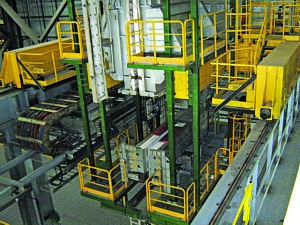 Induction Strip Galvannealing, developed by Ajax TOCCO, is easily integrated with new or existing equipment. Strip heater designs present many cost cutting opportunities for applications such as strip annealing, strip dryers, and taper heating for more uniform rolling.